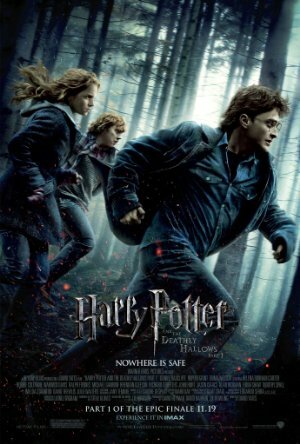 Harry sets on a quest to defeat Voldemort which involves unexpected twists and turns through the wizarding world. Book and series spoilers. Much has to do with tracking down missing pieces of Voldemort's soul. The late, beloved Dumbledore (Michael Gambon) has left obscure clues to their whereabouts, leading to two observations: (1) Beyond a certain level of obscurity, a clue lacks usefulness, and (2) How extraordinary careless of Voldemort to leave missing pieces of his soul lying about. -It's definitely worth noting that this was the first single book to be split into two parts (at least it kicked off the recent trend of doing it). I feel that with Deathly Hallows they were making up for exposition that didn't get in movies 5 and 6. It seemed more necessary than it's been for other movie franchises spreading their plot out to 2+ movies. -I really enjoyed the 7 Harry's scene and the transformation of each actor into Harry. I wish they'd included Bill and Mundungus in the previous movies so they weren't two randos there to rescue Harry. I mean, Bill is a Weasley and less of a random character but it felt forced to have him there and suddenly important enough for Harry to be delayed for his wedding (at least in the books the wedding was a day after his birthday). -I enjoyed the battle and thought Hedwig got a better death in the movie than the books. I like that she died flying in to protect Harry and not just as a caged bird. -The Death Eater meeting was another good scene. I really enjoyed the acting as well as the tense politics in the room. -The scenes at the Burrow after everyone returned from the Harry extraction were heavy exposition but felt like a necessary evil for the things the audience needed to know. -Their excursion into the Ministry was hilarious. This and part 2 have great Polyjuice scenes that seem to really have got the best out of actors. -The camping montage felt even more protracted than it was in the books. I thought the actors did a pretty good job with the conflict between them up to and after Ron's departure. -The Bathilda scene (lady turning into a snake) was very scary to watch in theaters but less so at home. I like the combined action and exposition that sequence offered. -Destroying the horcrux and Ron/Hermione's reunion was another highlight. I mean, I really have to give it to Rupert Grint for his performance in this. -Scary Hermione torture was terrifying and well done as a mostly off-screen moment. -ending with Dobby's death and then Voldemort getting the Elderwand was a down point but gives the next movie a clear rallying moment. -I feel like I don't have much to say about part one. I mostly enjoyed it. At this point in the series I'm rather resigned to the movies are what they are and they can only work with the history laid down by previous films. Huh, no comments? I enjoyed the scenes in the Ministry, the animated fairy tale, and the splinch sequence really drove things home in a way that clean death by curse didn't--that these kids are on their own, and that they are on a what will become a bloody death trip. Setting aside the story and the plotting and whatnot for a moment, I thought this film was striking and beautiful.